Organizations that want to take advantage of outside-of-the-box customer data will be excited by Salesforce’s latest release. The CRM giant has unveiled its Internet of Things Cloud, which is geared toward pulling in sales and service information from sensors and devices. Similar to how Salesforce has traditionally enabled businesses to log customer interaction data across smartphones, email, websites and web-based applications, the Internet of Things Cloud can gather data information from devices like refrigerators, lightbulbs and thermostats, among others. This means that any internet-connected device can provide organizations running Salesforce with information to respond to customer service inquiries, or to initiate upsell opportunities, without having to manually input data into the CRM system. Salesforce will leverage a new tool called Salesforce Thunder to gather and process all the data coming from the devices. Salesforce has been a huge proponent of the Internet of Things, specifically in the wearable space. The San Francisco-based company was one of the first enterprise partners for the Apple Watch. Apple and Salesforce have co-developed more than 20 business-focused applications for the smartwatch, most of which focus on enabling customer service reps to more quickly gather information on customers in order to provide better feedback. With Thunder, Salesforce can now apply the same principles to devices that are connected to the web, but not necessarily worn or carried by customers and professionals. The worldwide Internet of Things (IoT) market will increase 133% to $3.04 trillion (about £1.8 trillion, or au$3.3 billion) in 2020, according to IDC. The number of IoT-connected units will reach approximately 30 billion in 2020. 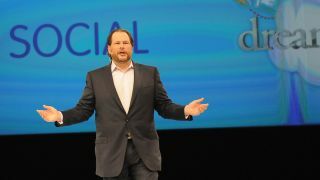 Salesforce competitor Cisco has been an aggressive evangelist of IoT technology. over the past year, Cisco has invested $1 billion (about £605 million, or au$1.1 billion) to build out a network to tackle what it calls the Internet of Everything.